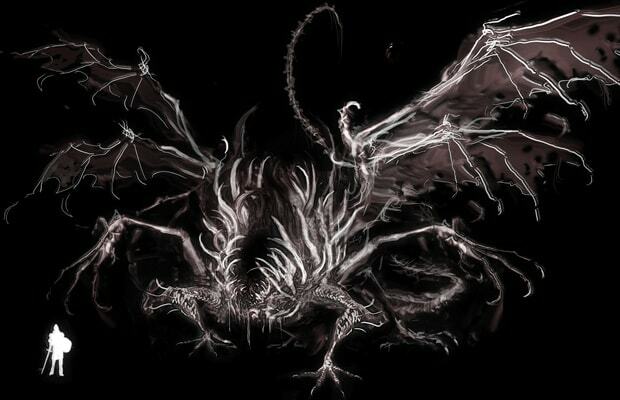 If you’re one of the Dark Souls fans that picked up the limited edition upon the game’s original release, you already know the horrors of looking upon the concept art for the game’s many grotesqueries. Compared to Dark Souls: Design Works (which looks like a tome you might find in the Duke’s Archives) the art book that was included with the deluxe version is nothing. And thanks to Udon Entertainment, a translated version of Design Works, previously exclusive-to-Japan art book is making its way to U.S. shores this October. Of course there’s more the game’s concept art than gross pictures of the aberrations like the flying beetlemanish cragspider and Quelaag, the spiderwoman – the world of Lordran can be picturesque in its own desolate way, and Design Works also includes interviews with director Hidetaka Miyazaki and some of the game’s art team. This is probably good news for everyone looking forward to Dark Souls II – maybe this means we’ll get more peripheral expansions like this in the future. (A making-of documentary on the blu-ray, perhaps?) Design Works will retail for $39.99, but Amazon is running a pre-order deal on this nice-looking volume right now.